OK, so the Amron Rinser may look a bit silly and the design is achingly simple in many ways (why has no one come up with it before?! ), but what a cool and pretty darn handy idea. 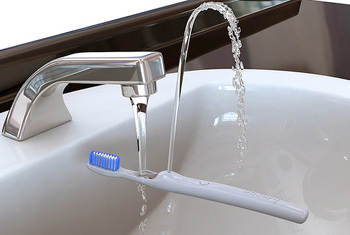 It’s not just the water fountain feature that will be great for keeping your mouth clean and refreshed, but the bristles are also interchangeable, so you don’t need to buy a whole new brush when they start to look a bit old and raggy. There’s a demo of the Rinser over at www.amronexperimental.com/amron-oral.html, but we’re pretty confident you can use your dazzling imaginations to glean how it works from the photo above. The Rinser isn’t available quite yet, but join Amron’s mailing list to find out more.